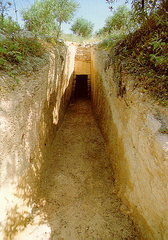 Tholos tomb with a rectangular chamber, built in the ecphoric system. A long, built dromos leads to the entrance. It is dated to the Late Minoan III period. The tomb was excavated by the 25th Ephorate of Prehistoric and Classical Antiquities in 1981, and was found looted, but few finds had survived.